Over the past few days we have been looking at tools to help us share valuable information and learning with others in our Professional Learning Network. By sharing, you are telling others that you believe something is worth their time. It is also a way for you to sort the content you want to look into more deeply in the future. Content curation can be deeper than simply organizing information. In the video below, Robin Good compares curation with choosing food when you are hungry. When we need to find information on a topic, “Googling it” isn’t enough any more. There is just too much out there. We want a deeper understanding. We want to read an explanation of the topic – a remix of sorts. Similarly, when we are hungry, just going to a fast food outlet and grabbing the quickest thing on the menu is not necessarily what we want. We would like something more substantial. We want to be able to choose the restaurant and then enjoy what the restaurant has to offer. As educators, how can we begin to think more critically about the information we are taking in? How can we more effectively share that information with our network? Curation is also a reflective process. Reflecting on content helps us remember it more clearly, and to build on it as we take in more information. Sue Waters has written extensively on the process of curation. As important as curation is for our own professional learning, it can be argued that students need to learn curation as a key 21 C skill/competency. Click the image to find the original post at edumanity.com. Barbara Bray explores this topic further in her blog, and asks, “If you don’t take the time to read the contents and just Scoop-it, then is the resource really useful and valuable? 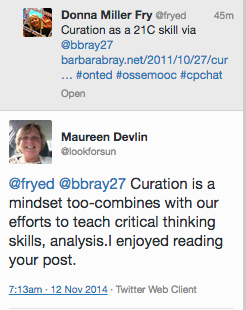 Certainly content curation skills are important for educators, as we model the kind of learning we want for our students. How do we properly attribute the information we are sharing? This is a poorly understood aspect of online curation. If you want to explore further, this post attempts to address the issue: The Curator’s Code. You can find more here: Brain Pickings on the Curator’s Code. Honouring your source of information is the underlying thinking behind the idea of a curator’s code. For example, if Mark posts a terrific article on Twitter, and I go and read it, I wouldn’t share it on Twitter again without adding via @markwcarbone, just to demonstrate that Mark shared it first and sent me off to learn from it. Honouring your source is always the best practice when sharing and remixing. Take a few minutes today to consider the role of curation in your professional life (both sharing and learning), and as a critical skill for our students. We have posted some reading below, as well as a video conversation on the topic of curation. As we work through this week we will explore tools for deeper levels of curation – more than just sharing links.